Moringa Herbal Supplements contains antioxdants and vitamins in large quantity.Moringa Ginger Tea or Moringa original tea contain 100% pure organic dehydrated Moringa leaves. 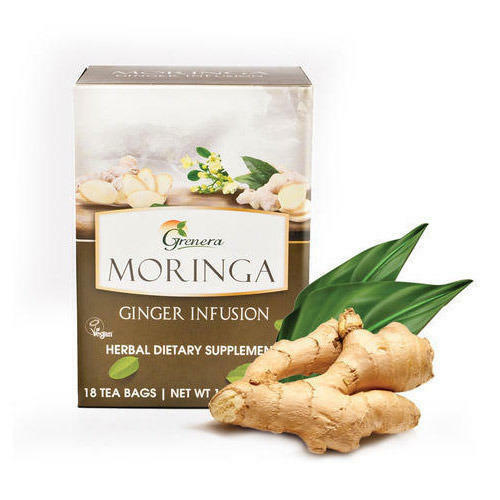 Moringa tea bag when infused in hot water gives an original flavor. Moringa tea contain good source of antioxidants. It is a natural tea and it gives good feel for us. It is prepared with original moringa leaf powder. Moringa Tea available in different flavors. We also looking for distributors.. Ever since the year 2010, Grenera Nutrients Private Limited, has been amongst the leading manufacturers and exporters of this highly commendable range of Health Foods. Manufacturing of this range is done as per the set FDA norms and guidelines, utilizing the finest ingredients in a perfect combination. This ensures the product’s effectiveness, shelf life and Nutritional content. Further, the offered range comprising the finest Moringa Green Tea, Moringa Pomegranate Infusion and Moringa Apple Cinnamon Infusion, is priced at the most reasonable rate possible. The highly advanced state-of-the-art infrastructural facility at Grenera Nutrients Private Limited, has been parted into several highly operational units, for reasons of attaining smoother and effective management of the firm’s operations. The facility regularly upgraded, helps us in extending our reach in the market. For reasons of attaining a number of the firm’s predefined goals and targets, the facility has been equipped with all the necessary machinery and equipment. Further, our highly ethical work practices, has helped us generate a huge client base. We are majorly exporting in Europe Regions: Switzerland, Netherlands, Croatia, Belgium, Czech Republic, Greece, Serbia, Denmark, Sweden, Finland, Austria, Newzealand & Asia Regions: Panama, Colombia, Cuba, Taiwan, Vietnam, China, Japan, Sudan, Brazil, Colombia, Costarica, Haiti, Cayman Islands, El salvador, Trinand & Tobogo. Mainly deals in Germany & Japan. We are recently exporting in USA , UK , AUSTRALIA , GERMANY, CANADA , SOUTH KOREA , HONG KONG , MALAYSIA, PAPUA NEW GUINEA, FRANCE, LEBANON, SWITZERLAND, SWEDEN, JAPAN, NORWAY, CZECH REPUBLIC, CURACAO, DENMARK, AUSTRIA, NETHERLANDS.